New Surgery Opening Times from Monday 27th August. *Dispensary telephones will be answered between 10 am and 5 pm. An answering machine will be available to record your details and prescription request if you ring between 9 - 10 am and 5 - 6 pm. 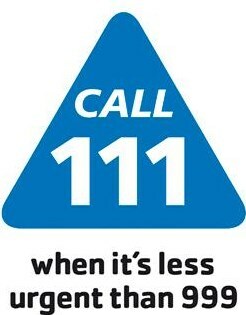 NHS 111 operates the out-of-hours GP service as well as offering non urgent health advice. If the surgery is closed please call 111 for medical advice and they will direct you to the most appropriate service. Calls are free from both landlines and mobile phones. The following leaflet provides information about the services available and choosing the service you need.